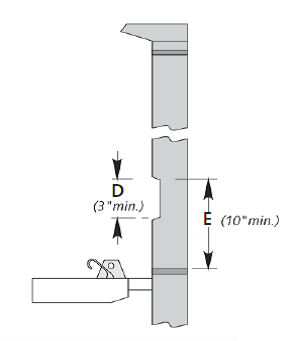 Measure the length of your existing mast gate (D in the diagram to the right). In order to install the Tides Track, the mast gate must be at least 3" long and open on both sides of the centerline of the luff groove. The distance from the top of the mast gate to the gooseneck should be at least 10” long (E in the diagram to the right). If the distance is less you might not be able to feed the Tides Track past the gooseneck and into the luff groove. 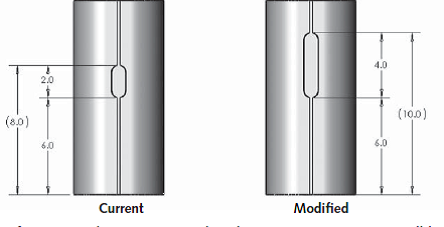 If your current mast gate configuration does not meet the above parameters, you will have to modify your existing mast gate accordingly. In the above example, the existing mast gate is 2" long (too short) and the distance from the top of the mast gate to the gooseneck is 6" (also too short). Simply enlarge the mast gate using a Dremel tool or grinder, moving up the mast until the top of the mast gate is 10" above the gooseneck. Your mast gate is now 4" long. The distance from the top of the mast gate to the gooseneck is now 10" long.